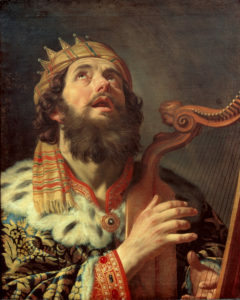 In the Church Year, as celebrated in the LCMS, today is set aside to remember King David. This is another day added with the adoption of the Lutheran Service Book. David, the greatest of Israel’s kings, ruled from about 1010 to 970 BC. The events of his life are found in 1 Samuel 16 through 1 Kings 2 and in 1 Chronicles 10-29. David was also gifted musically. He was skilled in playing the lyre and the author of no fewer than seventy-three psalms, including the beloved Psalm 23. His public and private character displayed a mixture of good (for example, his defeat of the giant Goliath (1 Samuel 17) and evil (as in his adultery with Uriah’s wife, followed by his murder of Uriah (2 Samuel 11). David’s greatness lay in his fierce loyalty to God as Israel’s military and political leader, coupled with his willingness to acknowledge his sins and ask for God’s forgiveness (2 Samuel 12; see Psalm 51). It was under David’s leadership that the people of Israel were united into a single nation with Jerusalem as its capital city. Appropriate prayers include a repentant heart, for loyalty to the Lord, for our political leaders and the political leaders of the world, for peace in the Middle East and for Church music and musicians.